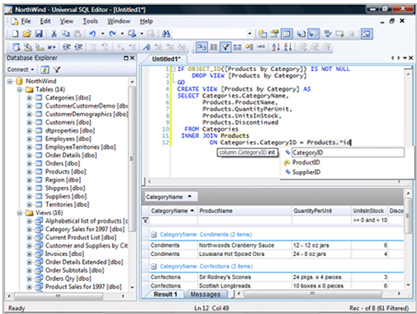 Universal SQL Editor is a powerful, yet easy-to-use database query tool. It allows you connect Oracle, DB2, SQL Server, Sybase and other ODBC compliant databases, and edit complex SQL with Intellisense-like code completion, highlight references, parameter hinting, syntax highlighting, SQL formatting, plus other useful features that allow you to work more efficiently. 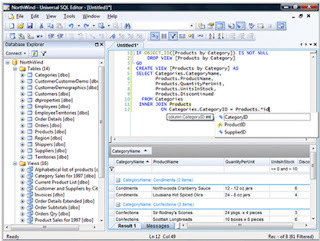 * Powerful SQL editor that features Intellisense-like code completion, highlight references, parameter hinting, syntax highlighting, SQL formatting, multiple levels of undo and redo, column mode edit, code folding, etc.